I suspect you’ll have to be pretty local to have these characters as your Local Folk. But we’re still loving the Book Bags they adorn. 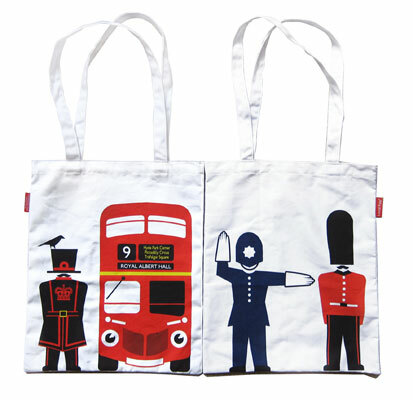 The bags are part of a range of accessories featuring ‘British Locals’ going by the name of ‘Buz’ the Queens Guard, ‘Liz’ the Queen, ‘Bob’ the Policeman, ‘Yeo’ the Yeoman Warder, ‘Sid’ the Punk and ‘Red’ the Routemaster Bus. Just some of those are featured on these brushed organic cotton bags, sized at 370mm x 335mm and great for carrying your books to the library or to the school.